How to Configure Proxy and Firewall On A Computer. 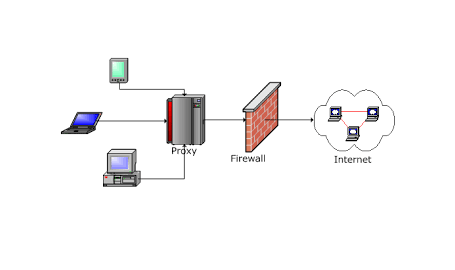 In computer networking, a proxy setting is a system that acts as an intermediary for request for resources. Meanwhile client software can be installed on any client machine and the proxy server. Data request sent from the client gets routed from the client side proxy through a back channel directly to the proxy server. The key concept part of this relationship is the additional metadata attached to the request by a client proxy that aids with identification once it hits the proxy server. So in essence the client server and the proxy works together to provide quick identification and access to resources. #1 set the proxy server setting to the correct IP address. #2 Exception can be made and set to include ranges ( for instance, you can bypass a proxy server if you access anything in the 192.168.x.y scope ). #3 Proxy setting can be set so that all HTTP or FTP connection use a proxy server, but no other connection. #2 select tools>>> internet options. #3 on the connection tap, select LAN setting. # 4 check use proxy server for you LAN. # 5 in the address box type the address of the proxy server, in the form of an IP address, a URL ( such aas http://proxyfor example). #6 in the port box type in the port number. #7 if necessary, select advance and configure separate proxy address for different services. #8 select okay until you return to internet explorer. Open the Internet Options control panel. Select the Connections tab, and then click the LAN settings button. Select Bypass proxy server for local addresses, then click the advanced button. Below Exceptions, add 127.0.0.1 to the list of exceptions. If you’re using a Firefox proxy extension, you may need to configure it separately. Enable or disabling port security on certain ports . If you’re using 1Password 4, add the folder C:Program Files1Password 4 (or at least all the .exe files in it) instead. How to create a virtal machine VM on a window 7 computer. How to configure Remote Desktop and Virtual Network Connection. ← Enjoy 12 HOURS OF Free Movies. Awesome post! Really enjoyed reading it, can’t wait for the next post!